Next year looks set to be the one in which the battle for the heart of the mobile phone goes into overdrive. While Apple continues to sign deals with UK networks, though you still only have one place to buy an iPhone in the US, its rivals are rallying the troops for a smartphone shoot out. Nokia has big plans to re-ignite its smartphone range next year with handset that may use the new Maemo platform that debuted on the N900. Meanwhile Palm apparently has some big announcements lined for the CES gadget show in January. As for Google Android, well that operating system appears to be getting everywhere from the new range of HTC mobiles through to models from Samsung, Motorola and others. And now in another major boost for the Google platform it appears that Acer is set launch a slew of new Android phones in 2010. 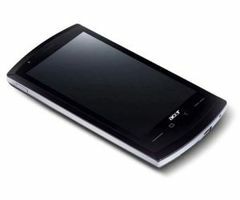 Digitimes reports today that Acer is supposed to release 8 to 10 new smartphones in 2010 and more than half of the number are Android based – the others will use the latest versions of Microsoft Windows. Acer recently debuted the A1 Android phone, a beast of a handset that has got a real cult following in both Europe and the US. the cellphone is very cool.